Staring down a massive wall of text is nobody’s idea of a good time. The solution isn’t to slap on a tl;dr at the end. What you need are good old-fashioned paragraphs. Paragraph breaks act as signposts for your reader. 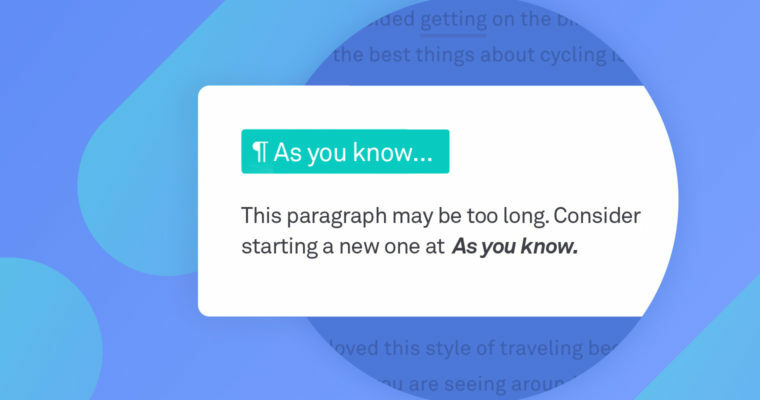 They can indicate that you’re changing topics or introducing new information, and they’re visual markers to keep your readers from losing their place in the text. But deciding where to break a paragraph isn’t always so clear cut. In school, many of us learned the classic five-sentence paragraph structure: topic sentence, three supporting sentences, and a conclusion sentence. It’s a great model when you’re writing essays, but it doesn’t work for everything. Every sentence in a paragraph should relate to a single idea, but there’s no rule about exactly how many sentences a paragraph should contain. Some formats, like news articles, blog posts, and especially emails, favor very short paragraphs. Unless you’re writing something that will be printed out, it’s safe to assume that your reader may be reading on a mobile phone. Small screen sizes make paragraphing even more important. A screen filled from top to bottom with no breaks at all in the text can feel overwhelming. Fortunately, Grammarly Premium can now recommend the best place to break your paragraph when it gets too long. How does Grammarly decide where the best place is? Read on for some examples. As a longtime supporter of the Children’s Art Museum, you have helped enrich the education of thousands of children throughout the metropolitan area. There would be no museum without the contributions of generous donors like you. With your support, we launched two new programs this year. The first, our Mobile Museum, brings hands-on exhibits and learning to public classrooms around the city. And the second, our Summer Art Camp, was so successful that we have already begun fielding inquiries about next year’s camp. I’m writing to you today to personally invite you and your family to join us at the Museum Gala on September 1. This members-only event is our way of saying thank you for your support of our mission. We hope you’ll join us for refreshments, live music, and a guided tour from our head curator. Building a case for your point of view or telling a story requires you to present information in a logical order. Paragraphs are a way of grouping related facts together so that your reader can follow your argument more easily. Start a new paragraph whenever you introduce a new idea or change direction in your argument. Planning the perfect party is a challenge, but organization can make it easier. After you’ve set the guest list, make sure to find out if anyone has any dietary restrictions. Try to include at least a couple of options on the snack table that they’ll be able to eat. You’ll also make life easier for yourself if you tidy up your place a couple of days in advance. There’s nothing worse than rushing around to put things away right before your guests start to arrive. On the other hand, it’s also important to remember that the perfect party is one that you and your guests enjoy. So try not to stress too much. As long as you have good food and good friends (and a good playlist), your party will be a success! Writing a conclusion or summary is a good way to make sure your reader walks away with your most important points in mind. Start a new paragraph when you begin your conclusion so that it doesn’t run together with the information above. The Laguna Theater was once the thriving center of our city’s downtown area. Indeed, the iconic building is still one of the most recognizable features of Park Street. Though it has fallen into disrepair after years of neglect, it has the potential to once again to stand as an important cultural draw for residents and visitors alike. Rehabilitation of the structure will cost only slightly more than demolishing it and constructing a new building in its place. In its heyday, the Laguna regularly drew over 1,000 theatergoers a night during performance season, and that kind of foot traffic would offer a huge boost to the businesses in the surrounding neighborhood. Taking everything into account, I believe that the city council should save the historic building from demolition by declaring the site a local landmark. If you agree, please join our strategy session this Saturday at 2:00 pm. And don’t forget to attend the city council meeting on Tuesday night and show your support!